Ukha is a hot liquid fish dish, which many mistakenly think of fish soup. It must be remembered that ear, and fish soup is not the same thing. The tradition of cooking soup evolved over the centuries. Today to cook the soup knows not everyone — after all, cooking soup implies certain rules of selection of fish, a selection of special dishes, a certain order of the bookmark of vegetables and spices etc. Cook soup only in stainless utensil — earthenware or enameled. 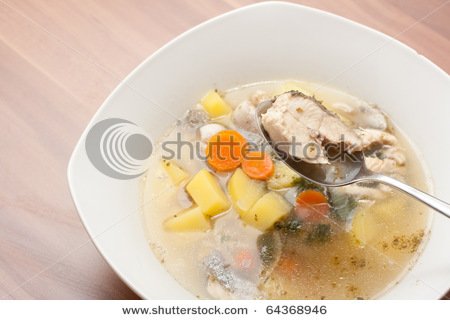 Soup is a classic Russian recipe, should cooking of such fish varieties that differ in flavor and provide a clear broth (perch, whitefish, ruff, perch). However, you can add a fish that has a rich taste in the first place is sturgeon, bream, crucian, burbot, IDE or Beluga. Traditionally Russian ear is not prepared from a single species of fish, and several (usually combine two or four fish). Exception — the ear of the red fish, which is usually a fish only one species. Some types of fish is categorically not suitable for cooking soup — for example, roach, bleak, gudgeon, mackerel, gobies. Such fish can be used for the preparation of fish soups, but cook soup of them. You can cook the soup and of sea fish — halibut, cod, womera, Swamy, nototenia. Ideally, to cook the soup you need fresh fish, for example, directly on fishing. Vegetables in soup should be putting a minimum — usually limited to onions, a small amount of potatoes, carrots. And here is a set of spices for cooking soup can be quite wide: parsley, saffron, leeks, dill, fennel, anise, tarragon, Bay leaf, parsnips, nutmeg and black pepper — choose those spices that, in Your opinion, improve the taste of food. Cook soup, depending on the type of fish — freshwater fish cooked at least twenty minutes, and the sea — from 8 to 12 minutes. Marine fish cannot digest — in this case, the meat can become tough, but using it as the base broth is less flavorful. A little secret of cooking the right soup is that it cooks without the need of the cover on a slow fire in an open pan. The main indicator of the quality of the finished soup — the transparency of the broth and the bright white color of the fish meat. CCS serve with black bread or pies. So, how fast and at the same time to properly cook a fish soup of river fish at home? We will need: half kilo of fish, two liters of water, two onions, two potatoes, one small carrot, a root and parsley, one root of parsnip, one tablespoon of fresh or dried dill, Bay leaf, tarragon, 8-10 peas of black pepper and salt to taste (about two teaspoons). Boil water, add salt and put in a pan cut into quarters potatoes, tails and heads of fish, cut into strips parsley root and carrots, and finely chopped onions. Cook the dish on low heat for ten minutes, then remove the foam and strain the broth. Add spices: pepper, Bay leaf and parsnip root. Boil the ear for another five minutes, then strengthen the fire and dip in the broth over the fish, previously cleaned and cut into pieces width of about five centimeters. Simmer all together over moderate heat for about fifteen minutes, without letting the broth boil. At the end add dill, tarragon and parsley, remove the pan from the heat, cover and allow the ear to stand at least ten minutes. 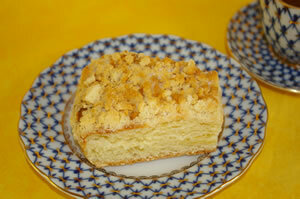 The kitchen or Kuchen (Kuchen is an ancient and very popular German cake, similar to the Russian cake, but without the cream. All the necessary ingredients immediately placed in the oven. It is prepared for a variety of celebrations: a birthday, a wedding, a birthday party. But since this pie to cook fairly easily, it is baked and in everyday life, for example at work, or when you suddenly looked guests. Consider two of the easiest and popular method of baking. Knead yeast dough, do not forget him at least twice "treated" (i.e. infuse). The dough should not be too tight. When they finally roll out and place on the baking pan, give him a little more to stand up and "get used" to the new form (20 minutes). One Cup sugar, yeast, salt dissolve in warm milk. Pour half of the flour, mix thoroughly and put in a warm place. After mass taposiris and two times increase in volume, add 200 gr. melted butter, beaten eggs and remaining flour, and also need to knead the dough, which should not be steep. Then again allow to rise. For a time, until dough is on the baking sheet, you need to make the topping (Rivel). To do this, take 200 gr. flour and 125 gr. butter. It, butter, warmed to room temperature, carefully knead with flour. After this is supposed to be diverse in its form lumps. Them and sprinkle the dough cools. Further, all put in the oven (170 degrees) and give the cake to rise and bake. Preparation topping: 50 grams. butter to grind with 0.5 cups of sugar and the sachet of vanilla. Add the flour to make crumbs. Sprinkle top of dough butter-sugar crumbs and place in the preheated oven for 30-40 minutes. The required temperature of baking: 200 degree. That cake is not a donkey, the first 20 minutes the oven door do not open. When the kitchen is browned, check for readiness with a fork or toothpick. Ready pie cool slightly, then cut into slices. Ready! Do not put the sugar ahead of time, and it's going to ruin the whole product! They can be sprinkled only in the case when the kitchen has been removed from the oven and almost cooled. 1. To make the topping (Rivel) less crumbled, need to spread the blank of a mixture of one egg, a couple spoonfuls of sour cream and sugar. This should be done before you pour the butter-flour crumbs.